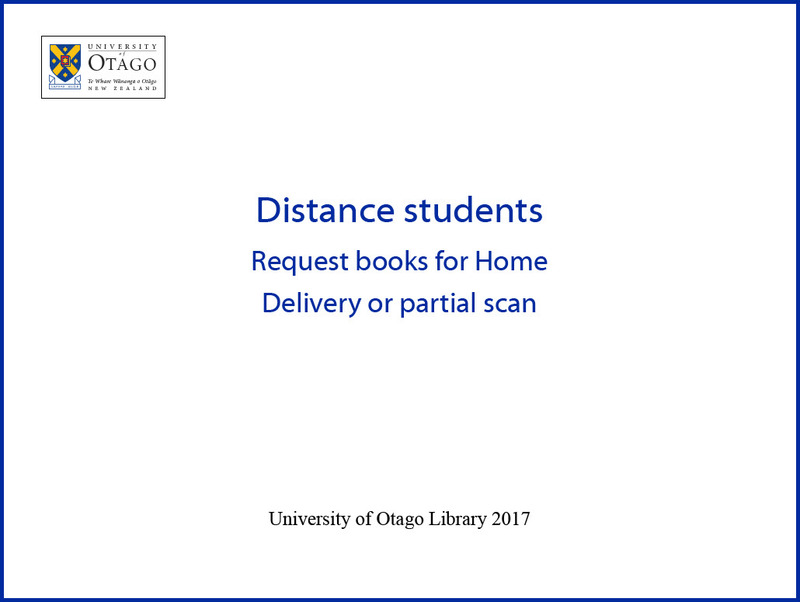 If you're on placement away from home you can request books to be sent to your temporary address and scans of book chapters and articles to be emailed to you. Update your Semester address (if you're at a temporary address while on placement) in eVision before placing requests. We send items to you by courier, and you can return them the same way at no cost to you. 1. Update your Semester address in eVision if you need to - this is where your items will be sent to. 3. If we hold the book it will appear in the results list. Lots of results? Use the filters on the left to narrow it down. 4. Sign in – You need to be signed in to get full access to online content and request options. You'll see your results list again once you've signed in. ‘Available Online’ indicates an ebook and you should be able to access it online. If the book isn’t available online, look for an ‘Available in the Library’ version in the results list. If there are several editions of the book, make sure you request the one that you need. Click on Request (for Home Delivery). Select pickup location of Home Address. You may not see the Home Address option. If you're living outside Dunedin, you can still request items for Home Delivery. Select your nearest Otago library (e.g 'Wellington' or 'Central') as the pickup location and type 'please deliver to' and your delivery address into the comments box. 1. Click on ‘Scan Request’. 2. In ‘Request details’ enter the chapter details, you can copy and paste your citation - note the copyright information as a guide to how much we can scan for you. Click on the image below to see the video, or follow these instructions to request issues or articles from journals that we only hold in print. 2. If we hold the journal it will appear in the results list. Lots of results? Use the filters on the left to narrow it down. 3. Sign in – You need to be signed in to get full access to online content and request options. You'll see your results list again once you've signed in. ‘Available Online’ indicates an ejournal and you may be able to access the issue/article you want online. Check the dates listed against the database name to make sure the database has the year that you want. If the journal isn’t available online, look for an ‘Available in the Library’ version in the results list. 4. If the journal is held at several locations, you may need to click on a location (on the 'Available in the Library' tab) to see the request options. 5. Check the 'Holdings' dates to see if we hold the issue you need. To request a journal issue, choose from the issues listed on the tab, or click on 'Request a different issue' at the top of the tab. . Complete the request details, and select the pickup location of 'Home Address' if you see it (right at the bottom of the list). To request an article scan, click on 'Scan Request' to the right of a listed issue, or 'Request a scan from a different issue' at the top of the tab. Click on 'Request'. You’ll see a Request placed message, if your request was successful. If we don’t have the volume / issue number you require use the ‘Request an Interloan’ option and we will get it for you. 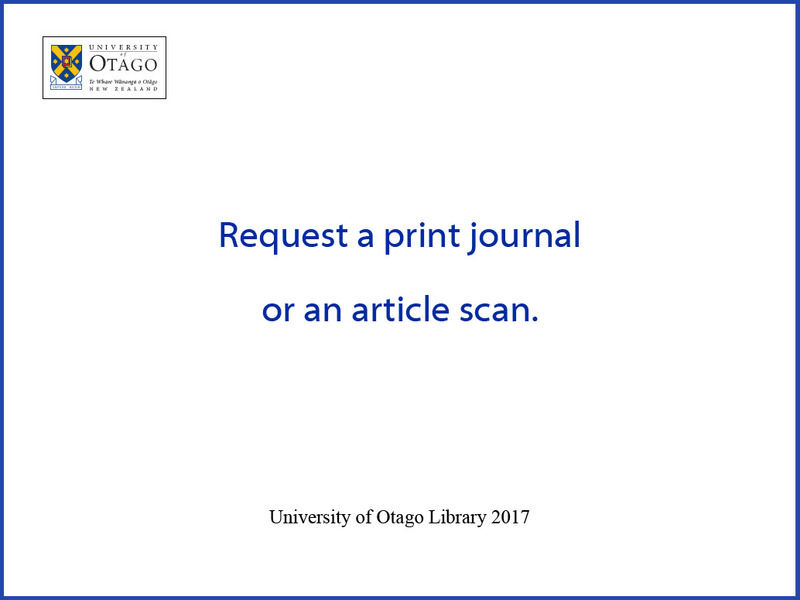 We will scan the section you want (within copyright guidelines) and email it to your @otago email address. Can’t find it in Library Search? If we don’t have the item you want in print or online, you can request it via Interloan.